You are here: Home / News / News, Propaganda, Uniforms / Brand new Patches! Now in Stock! Brand new Patches! Now in Stock! After many weeks and months of undercover research and development, we’re proud to release these state of the art Toy Soldier Round Patches into the wild of the world. Measuring 3 inches (77mm) in diameter and 99% embroidered, we think these are the perfect addition to a Toy Soldiers uniform, be it on their chest, arm, hat, or even bag! Easy to sew or glue on, we hope to see many a Toy Soldier make this part of their outfits. They’re priced at $5 and no matter how many items you purchase in the TSU shop, postage will never be more than $5 where ever you are in the world. And remember, Toy Soldiers Unite is completely non-profit, so once the cost of servers and merchandise has been covered, anything left over at the end of the financial year (being April in the United Kingdom), will be donated on behalf of the Army of Toy Soldiers to a worth while charity sharing Dr. Steel’s ideologies, chosen BY the Army of Toy Soldiers. Not only are you buying a snazzy bit of decoration for your uniform and supporting the Toy Soldiers Unite website, but you’re also putting money towards a worthy cause. We’ll be running a poll later on in the year to choose said charity. 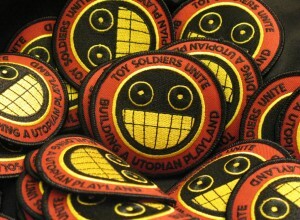 Remember, you need to be a registered member of the website to access the Toy Soldiers Unite shop. So if you haven’t already, sign up, and you get access to the shop, the forums, and the livechat pages! Previous Previous post: Toy Soldier of the Week: Madelchai! Next Next post: Toy Soldier Of The Week: Caecilia Kolibri! Looks over the little orphan scout uniforms…….does not see uniforms….goes to laundry room….sees burnt out shell of room….looks to roster….sees that the firebug was in charge of this weeks laundry….makes list of new uniforms needed with brand spanking new patches….assigns Orphan Scout Firebug to mind control cookie baking…. Just got my patches and pin in! They are fantastic! Can’t wait to sew my new patch to my vest to wear at work. Awww Dermut need a new patch?